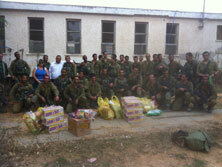 We received a phone call from one of the other organizations we work with here in Sderot. They told us that there were some Solders in town who were using a old apartment complex for training. He said in as much as it is the fifth day of Hanukah and that they put their lives on the line to protect us that he would like to bring them some Hanukah treats. 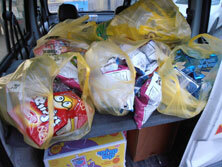 He said he had some candy and chips but needed some help purchasing more for them. It didn’t take a lot of thought to decide whether we would help out or not. These are the same (kids) solders that defend our Sderot border that abuts Gaza, where all the Kassams come from. As we watched them train, making entry into the building and training evacuating wounded soldiers, knowing that these kids may be called on at any time to defend us. It was the least we could do to bring them a little bit of joy. After we dropped of the candy we had to pass by the training site again and it was quite the treat to see them all taking a break from training, all with a bag of chip as the drinks we brought them. We later got a text message from their commander telling us thank you. He told us it boosted their moral to think that people they didn’t know were thinking about them; in fact he said it brought tears to the eyes of one of his solders. On the seventh day of Hanukah we were asked to help bring a little Hanukah joy to some of our senior citizens… so it was off to the candy store one more time. We filled up the shopping cart up with goodies, repackaged them all into gift bag and delivered them to the people who would deliver this bit of Hanukah joy. Even though we did not have a major Hanukah party this year we were still able to bring joy this Hanukah to people in Sderot.